Seven Muslims have been jailed for their role in religious clashes in the Burmese town of Meiktila in March. One man was jailed for 34 years for killing a monk; the others received sentences ranging from two to 14 years for crimes including unlawful assembly and religious disrespect. At least 43 people - mostly Muslim - died in the violence that erupted after an argument at a Muslim-owned shop. So far no Buddhists have been convicted in connection with the deadly clashes. The monk was knocked down from his motorbike by a group of Muslim men, beaten and killed, according to reports. A boy of about 15 was also convicted alongside the six Muslim men and sentenced to seven years. He will be detained in a juvenile facility. Apart from the monk, Meiktila's violence was almost entirely directed against the Muslim minority. 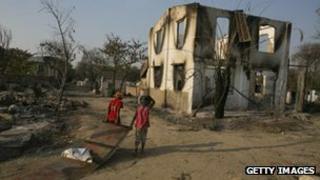 It sparked small outbreaks of violence in at least three other towns and left more than 12,000 Muslims displaced. The owner of the gold shop where the initial argument took place, his wife and an employee were convicted of theft and assault in April. Despite damning video evidence of Muslim homes and mosques being burnt and people being hacked to death, justice for the Buddhists is proving much slower, reports the BBC's Jonah Fisher. More than 40 Buddhists are thought to be in prison but a lawyer told the BBC that their court cases were still in their early stages. The clashes in Meiktila were the worst since ethnic violence in Rakhine state last year, where nearly 200 people were killed and tens of thousands forced from their homes. The conflict that erupted in Rakhine involved Buddhists and Rohingya Muslims, who are not recognised as Burmese citizens. The communities remain largely segregated in the wake of the violence, with many displaced Rohingya Muslims living in tents or temporary camps.